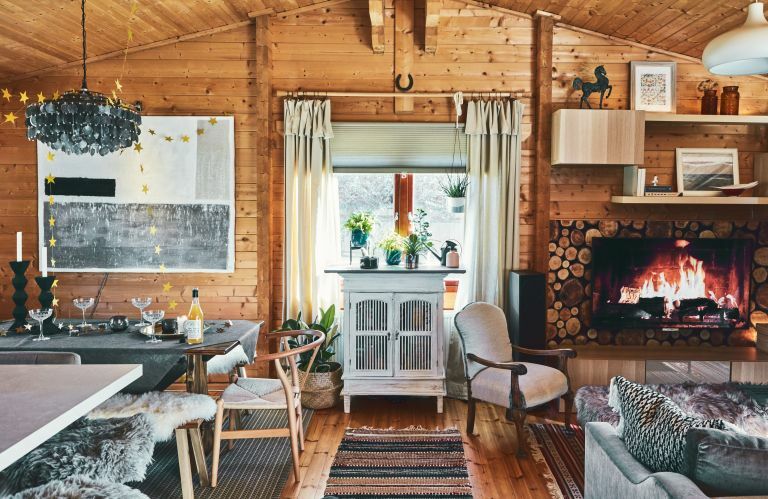 Living in a log cabin might seem like a ski holiday luxury for most of us, but the chalet-style home that Pia shares with her boyfriend, Seb, is the result of a peculiar set up. Because of Seb’s work commitments – he needs to be on the farm at all times to supervise – the farm owners agreed to supply the couple with their own on-site home. Find out how they got on making it into a home. Then check out our guide to renovating a house – and browse all our other gorgeous real home transformations. The farm hired a pre-built cabin company to design and build the property. ‘Everything was pre-planned, from cable routes to switches,’ Pia says. Get inspiration, ideas and advice straight to your door every month with a magazine subscription. Having a social space is obviously important to the couple, and the centrepiece of the main living room is the dining table. Pia and Seb rescued it from a pub clearance and restored it at home. ‘It was a typical old pub table with 15 layers of black paint on it. Seb and I spent hours sanding it down to expose the wood,’ Pia says. Most of the furniture in Pia and Seb’s house is reclaimed, inherited or upcycled. When they do buy new items, it requires careful thought. ‘Seb and I don’t get rid of anything until we find the perfect replacement,’ Pia says. Pia describes her style as Scandi-folk-eclectic. ‘It feels like home because we have all these pieces we’ve made,’ she explains.